From the Middle Ages until today. Olive trees have always been present in the lake Garda area and started to have a key role in the 7th century A.D. as witnessed by a edict of year 643 which applied financial sanctions to whoever was caught damaging olive plants in the villages surrounding Lake Garda. Already since the Middle Ages Garda oil was renowned for its high quality and the high economical value in comparison wit oils from other regions and it was used with excellent results both for dietary and medical purposes. The nutritional use was intended only for few people, because in the Dark “4-6 Kg of Garda oil olio were worth as much as a very large pig”. During the Renaissance human activity instead contributed towards defining the distinctive traits of the agricultural landscape and generally of Lake Garda. In this age slopes started to be redesigned with elaborate arrangements, which became proper “terraced” constructions facing towards the lake, suitable for olive tree grove cultivation and so typical that they make the area famous, so much that it was called, already in 1968, “Olive tree Riviera”. The fame of Garda oil has since then increasingly grown. 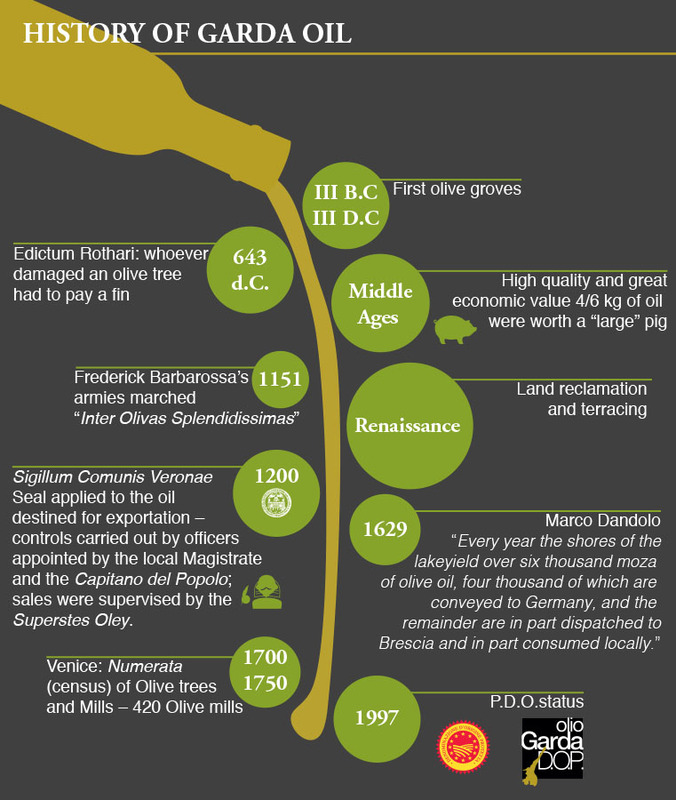 Today the Garda DOP oil is among the top 5 Italian DOP olive growing enterprises.